The EMB milk price comparison has been recently reworked to ensure better comparability of farm-gate milk price within Europe. The updated calculation template shows the farm-gate price with and without dairy-specific surcharges and reductions. Standard values have been set at 4.0% fat and 3.4% protein. How are the reported prices calculated and how is the comparison structured? a) In Line A, you have the reported milk price excluding surcharges and reductions received by a dairy for a standard kilogramme of milk with 4 percent fat and 3.4 percent protein. This is the milk price that every farmer receives, independent of quality criteria/further grading. To this aim, the farm's milk volume with its fat and protein content is converted to the volume of standard milk with 4% fat and 3.4% protein that the farm would have delivered and then equated with the farm-gate milk price. b) In Line B, you have the percentage by which the milk price has changed month on month. As of 2016, it will also be possible to include how the milk price has changed in relation to the same month in the previous year 2015.
c) In Line C, you have the price for milk with 4% fat and 3.4% protein including surcharges and reductions paid to the reporting dairy farm. 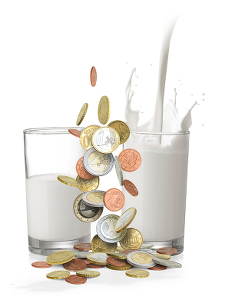 Back payments will only be calculated at the end of the year and taken into account in the average annual milk price. All milk prices are excluding VAT. The bills correspond each to an individual farm or their dairy. The farms/dairies are each marked with a number which is preceded by the relevant country code. Example: the two participating farms in Belgium are numbered as follows: BE1 and BE2. Call for participation: We are looking for farms willing to provide us their milk statement!